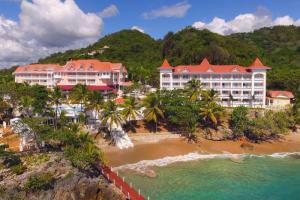 This charmingly secluded adults-only getaway offers 149 exclusive rooms overlooking the picturesque Samana Bay. Guests can indulge in delicious Italian and Brazilian cuisine and discover a romantic setting among the natural wonders of the Caribbean. The resort features gorgeous coastal views, a beautiful pool and spa, and a welcoming tropical atmosphere. Tucked into a gorgeously unspoiled cliff along Samana's coast.